A number of lines of evidence suggest that multiple sensory inputs that are influenced by gravitoinertial accelerations, including those from the vestibular labyrinth, retina, cutaneous and muscle receptors, baroreceptors, and abdominal visceral receptors, are integrated to produce an accurate perception of the location of the body in space, particularly during unusual conditions (e.g., swimming underwater). Such a processing of multiple sensory inputs appears to be important in coordinating appropriate motor and autonomic responses during movement and changes in posture. Although particular effector systems are most strongly influenced by particular sensory inputs (e.g., extraocular muscle contractions are driven powerfully be signals from semicircular canals, whereas components of the sympathetic nervous system that innervate vascular smooth muscle are strongly regulated by baroreceptor inputs), the “secondary inputs” and cerebellar contributions can potentially shape the responses, reduce their latency, and improve their accuracy. Because movement frequently requires coordinated changes in limb, axial, and respiratory muscle activity, accompanied by stereotyped adjustments in the cardiovascular system, it is important to explore the organization of components of “central motor programs” or “central pattern generators” that coordinate both motor and autonomic responses during the execution of movement. 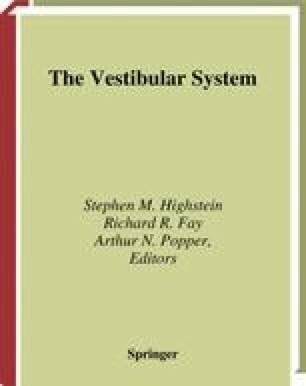 In addition to motor control, it is important to acknowledge the implications of the extensive convergence of vestibular and autonomic afferent information in the brain stem and cerebellum for spatial perception and affective changes associated with motion sickness and vestibular dysfunction. It appears that responses of vestibular and nonvestibular receptors to gravitoinertial challenges are integrated centrally to generate perceptual representations of gravitoinertial challenges. In addition, the visceral manifestations of motion sickness and vestibular dysfunction may be regarded as referred visceral discomfort related to gravitoinertial stimulation in the same sense that angina pectoris is a referred somatic pain related to cardiac dysfunction (Balaban 1999). Because these referred complaints are unpleasant and are not readily attributed to balance function, they may serve as eliciting or reinforcing stimuli for conditioned avoidance of situations that evoke discomfort. This conditioned avoidance may be one aspect of the linkage between balance disorders, height vertigo, and agoraphobia (Balaban 1999).